This has been a favourite of mine. It can be used for any occasion and both male and female cards. So I am a bit sad to see such a versatile embossing folder leaving us. So today I thought I would make a project using it. But I used it a little differently to how you would normally use it. And I was pleasantly surprised with how well it came out. So today I am also going to share with you how I did it. I love experimenting with different techniques. Here is the full card. 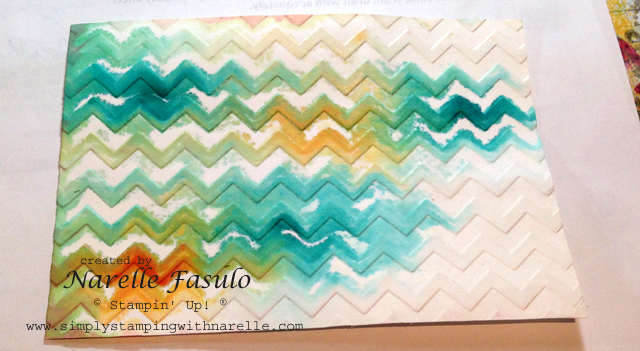 I started with a piece of Whisper White card stock that measured 5 ¾" x 4". 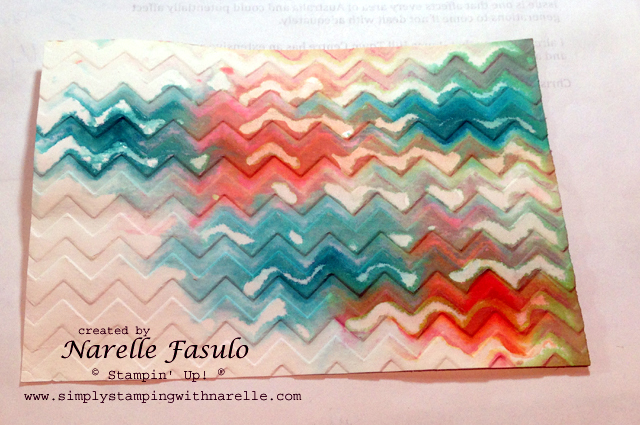 I then placed the opened Chevron embossing folder on some scrap paper and dropped some ink on it. I used Bermuda Bay and Tangelo Twist. 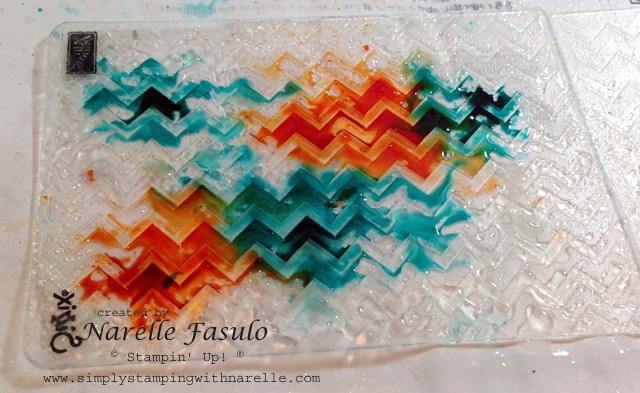 Then I spritzed the embossing folder with some water. As you can see the ink spread and mixed in some places.I then very carefully placed my piece of Whisper White card in the folder, closed it and ran it through the Big Shot. Depending on how much water you use, this can get a bit messy. So make sure you have paper towel handy to clean up any spills. 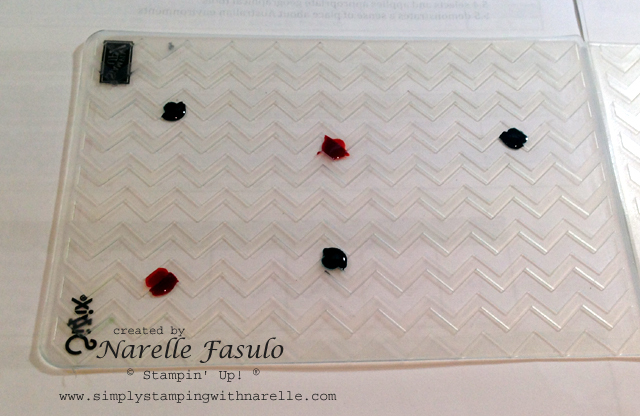 When you remove the card stock from the embossing folder it will be very wet. I used the heat tool to dry it thoroughly on both sides. The colours will become paler as they dry. 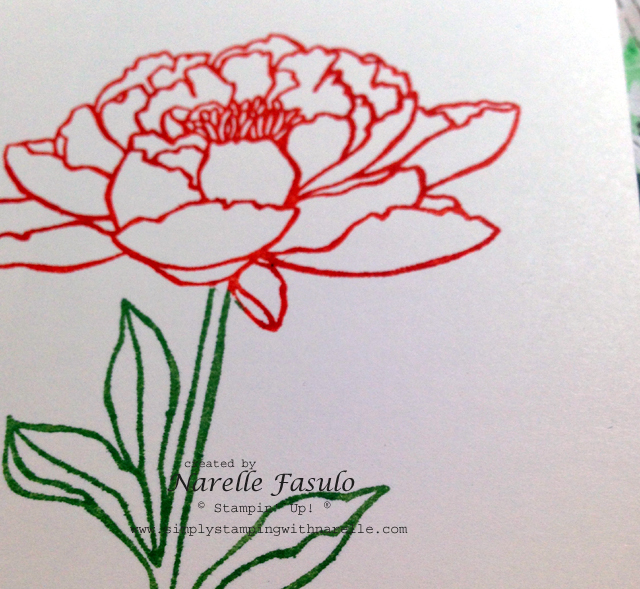 You will end up with a cool ink pattern and an embossed piece of card stock. And I found that the two sides looked very different. So I just chose to use the side that appealed to me most. 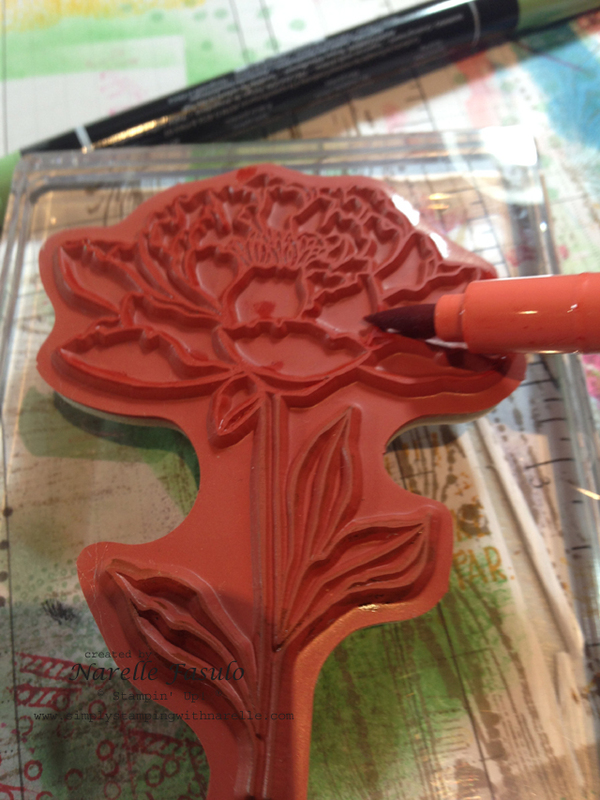 Next I coloured the flower stamp from You've Got This with Stampin' Write Markers in Tangelo Twist and Old Olive. Then I cut it out. 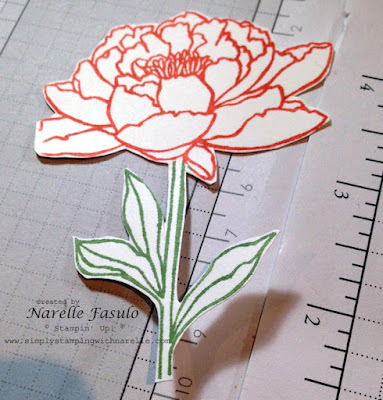 I love fussy cutting, and it really isn't that hard. So once I had the basics I wanted on the card, I looked for what could compliment the background and the flower. I had some Bermuda Bay ribbon but I had none in Tangelo Twist. Then I spotted some Natural linen retired ribbon. So I popped some of it into a plastic bag with some Tangelo Twist ink. 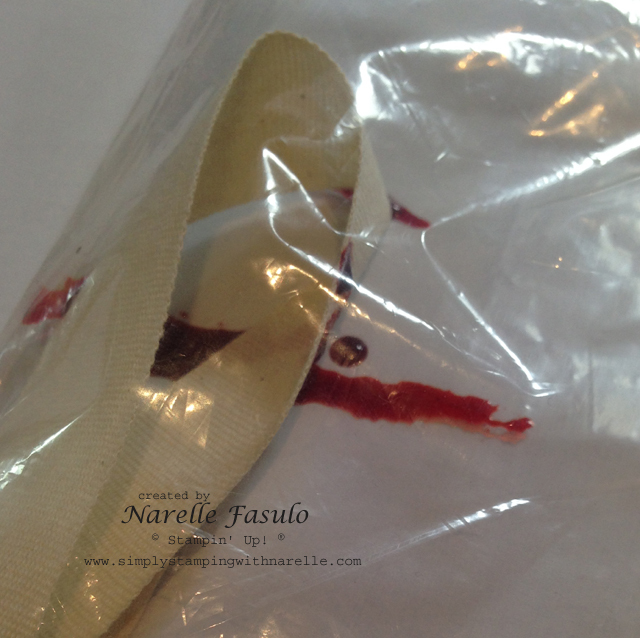 I massaged the ribbon and I had no idea how it would turn out, but it was fun having a play. I was surprised how well it worked. The card needed a greeting, so I looked through my retiring stamp sets and chose the Hello sentiment from Perfect Pennants.Now the card was ready to asemble. I cut a piece of Bermuda Bay card stock to measure 5 ⅞ " x 8 ¼ " and scored it at 4 ⅛". I folded along the score line to make a standard card. Then I attached each element as shown. First the linen thread, then the coloured ribbon which I folded upon itself in two places. Hold the fold in place with a glue dot. Then I attached the Bermuda Bay ribbon. The flower is raised on dimensionals as is the Hello sentiment. 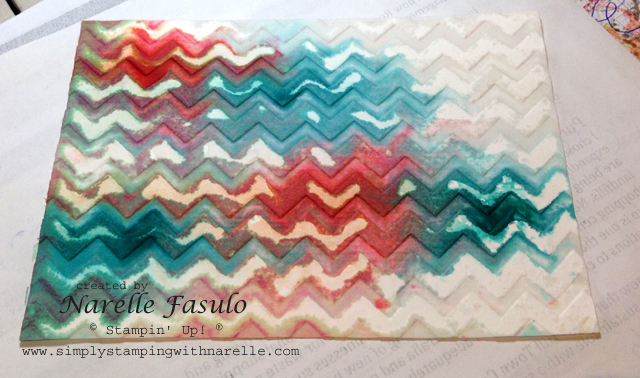 Once I completed the card front I adhered it to the card base. I hope you like my card and enjoyed learning how I made it. 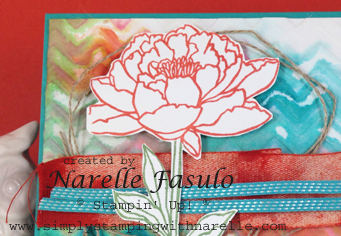 Don't forget that the Chevron Embossing Folder and the Perfect Pennants stamp set are both on the Retiring List. So if you want them, you had better order them soon. 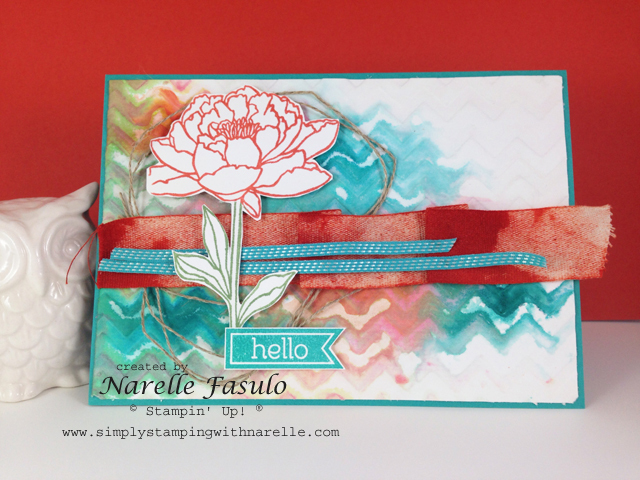 Have a great day and just keep stamping.